Freiburg - Nicolas Höfler was SC Freiburg’s hero for the second time this season as he snatched a 1-1 draw for his side at home to Eintracht Frankfurt on Sunday. After a goalless first half in which the Bundesliga’s two UEFA Europa League contenders sized each other up, an own goal from Christian Günter gave the visitors the lead. However, Christian Streich’s side deservedly levelled through super-sub Höfler, before Frankfurt were reduced to ten men, but couldn't muster up their first win of the season. Frankfurt’s return from their 3-0 win over APOEL FC saw them land back in Germany at just after 6am on Friday morning, yet there were no signs of tired legs as the Eagles flew into action at the MAGE Solar Stadion, as Vaclav Kadlec went close to opening the scoring within 90 seconds, denied only by the leg of the onrushing Oliver Baumann. The pair renewed their rivalry in the 10th minute with the Freiburg custodian again coming out on top, not too long after he saw Sebastian Rode shoot wide. The opening stages clearly belonged to the visitors with Freiburg only getting into the game in the same fashion as their flight back from Andalusia on Friday afternoon - with a significant delay. with proceedings flowing from end to end, Constant Djakpa’s drilled ball across the face of goal taking a crucial deflection off Baumann’s leg to miss the far post, even if the full-back was probably looking for a team mate in the middle. Likewise at the other end, Jonathan Schmid whipped in a low ball which Francis Coquelin failed to put the finishing touches on. 10 minutes before the break, with more balance in the game, Pavel Krmas rose highest, but not high enough to get the necessary direction and power on his header as the sides went in level at half time. Freiburg’s marked improvement carried over into the second half with Sebastian Freis stinging the palms of Kevin Trapp before the visitors took the lead against the run of play, and in bizarre fashion. 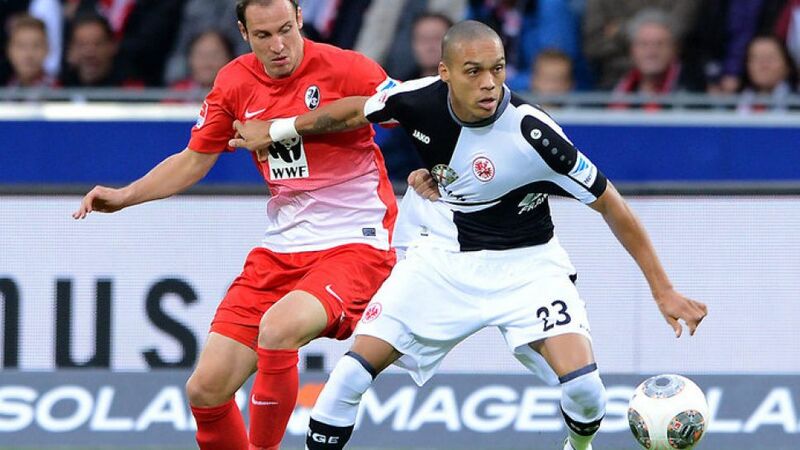 Djakpa’s low cross from the left signalled danger, even if there was no Frankfurt striker able to reach it. Baumann was nevertheless uncertain and stuck out a leg, striking the ball against his own defender Günter, whose knee turned the ball into his own net. The goal ensured a new Bundesliga record of 174 days without a goalless draw will be reached come the next league encounter between 1899 Hoffenheim and Bayer 04 Leverkusen on 18 October. It also forced Freiburg to attack even more intensely, with Mike Hanke sent on to help out in that undertaking. Höfler, the man who denied FC Bayern a win on Matchday 4, was Streich’s final gamble and he almost beat Trapp with his first touch of the ball, striking the Frankfurt goalkeeper with his shot. Lightning did indeed strike in the same place for the second time, however, when Höfler rose to meet Schmid’s corner at the far post, heading a ball which caressed the inside of the post on its way to bringing Freiburg level. Former Freiburg midfielder Joahnnes Flum then earned a second yellow card in a ferocious conclusion to the game which ultimately failed to yield another goal, leaving both sides tired and largely disappointed.